Say goodbye to the Galaxy's home button and hello to an infinity display. Samsung (SSNLF) unveiled the Galaxy S8 and S8+ at an event in New York on Wednesday. The new phone displays are bigger than the Galaxy S7 and S7 Edge and they have curved screens that flow onto the sides. The S8 will be the first phone to feature Bixby, Samsung's new AI assistant. Despite a crowded voice assistant market, Samsung insists Bixby is "fundamentally" different from competitors like Apple's (AAPL) Siri and Amazon's (AMZN) Alexa. It remains to be seen how this will play out. Samsung touts the assistant as being able to "see, remind and recommend," but much of this functionality is already available with rival assistants. One potentially interesting feature is the ability to observe behavior patterns and add in reminders. For instance, if you usually call your mom at a specific time each day, Bixby will ask you, unprompted, if you'd like to call her at that time. Samsung plans to make Bixby available on all of its appliances, from air conditioners to TVs. There is a designated Bixby button on the side of the S8, which is unlike its rivals. Like previous models, the S8 can be submerged for 30 minutes in up to 5 feet of water. People can also use facial recognition to unlock the phone, which Samsung has offered in the past. The Galaxy Note 7's iris scanner allows you to open the phone with your eyes and the new phones will offer this tech as well. Samsung planned to release pricing later Wednesday. Preorders start on Thursday and the phone will begin shipping April 21.. The S8 will initially be available in midnight black, orchid gray and arctic silver in the U.S.
Related: What does the future hold for Samsung's Galaxy S8? The South Korean tech giant has a lot to prove following the global recall of its exploding Galaxy Note 7s. "As you all know, it has been a challenging year for Samsung. A year filled with valuable lessons, hard decisions and important new beginnings," DJ Kho, president of Samsung's mobile communications business, said onstage at Wednesday's event. Problems with the Note 7s arose shortly after the launch last August, with several complaints of devices catching fire when charging. Some replacement phones also caught on fire. Samsung initially blamed faulty batteries, but some experts believe a design flaw may have been the cause. The recall wiped out billions of dollars of profits and hurt Samsung's brand. 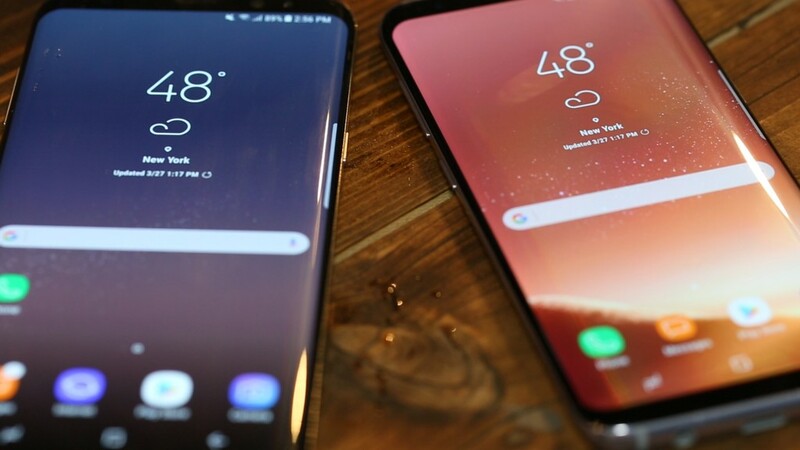 "The launch of the new device must be perfectly executed for Samsung to gain innovation leadership and to gain market share in the high-end smartphone segment," said Thomas Husson, vice president and principal analyst at research and advisory firm Forrester. Samsung's Galaxy S8 will also be going up against the newest version of the iPhone, which is due out later this year. Expectations are high for the new phone, likely called the iPhone 8, partially because this year is the 10th anniversary of the device. "Samsung only has a window of opportunity of several months before the launch of the 10th anniversary iPhone," Husson said. "The launch of Samsung's new flagship smartphone is thus key for the brand even though it has managed to reduce its business dependency on smartphones, contrary to Apple." Despite the Note 7 debacle, Samsung reported a profit of 9.2 trillion won ($7.9 billion) for its most recent quarter, an increase of 50% from the year prior and its highest level in three years.